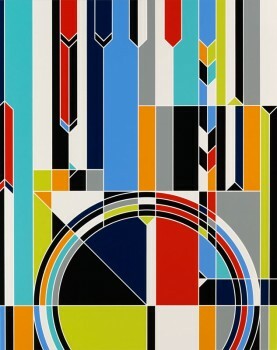 Since the mid-1990s Sarah Morris has been creating complex, geometric, abstract paintings derived from cityscapes and architectural detail, signs and symbols. To celebrate the Paralympic Games 2012 in London Morris has created an abstract representation of one of the city’s most iconic landmarks: Big Ben. The grids and vivid colours create a sense of dynamism and also may evoke images of athletic tracks, swimming lanes, and field markings.